When the plane carrying football star Flash Gordon and journalist Dale Arden crash lands into the house of Dr Hans Zharkov, the duo find themselves coerced into travelling to the plant Mungo, the apparent source of a series of bizarre weather phenomenon that Earth is experiencing. Once there, they discover Mungo is ruled with an iron fist by Ming the Merciless, and its up to Flash to put a stop to his plans before Earth is destroyed. The origins of Flash Gordon stretch back to the early 1930s. Created by Alex Raymond, the character first appeared in comic strip form on January 7th 1934 and was both inspired by, and in direct competition with, Buck Rogers. In the original strips, Gordon was a polo player and Yale graduate - and was portrayed as the archetype American hero. When a plane carrying Flash and his companion, Dale Arden, crashes near the home of Dr. Hans Zarkov, the pair finds themselves kidnapped. Zarkov is convinced earth is being attacked from the planet Mongo and coerces Flash and Dale to travel there with him in a craft he has created. Once there the trio faces off against Ming the Merciless who is revealed to be behind the attacks. The strip would take in a number of locations across Mongo, and the adventurers would find themselves both helped and hindered by the planet's inhabitants. Ming would ultimately be overthrown, and this enabled Flash's adventures to take in other planets and galaxies, alongside regular visits to Mongo. The strip was incredibly popular, appearing in daily and Sunday papers across America. Raymond's Sunday run would last eleven years, while Austin Briggs would produce daily strips from 1940-44. Going forward from there, Briggs worked on both strips, before passing on the weekend edition to Mac Raboy in 1948. In the years that followed, Dan Barry took over the daily run, while Raboy continued to work on the weekend strip, until his death in 1967. Flash Gordon continued to be a staple of American papers for many years; with Barry himself working on both daily and weekend strips until 1990. The latest story, Flash Gordon: Zeitgeist appeared in 2011, with a Ming spin off following in 2012. Over the years there were also novels, along with reprints of the earlier strips, radio serials and at least one magazine adventure. Such was the popularity of the characters that a serial movie was put into production in 1936, with athlete Buster Crabbe as the titular hero. Shown in thirteen installments, Flash Gordon followed a similar storyline to the comic strips, with the characters initially landing on Mongo and facing off against Ming the Merciless. Each week's segment would follow on from the previous one - which always ended on a cliffhanger to ensure a returning audience the following week. It was the first primarily science fiction based serial ever made, and would eventually be released as a stand alone picture entitled Rocket Ship. Two further serials would be created, with Crabbe and the majority of the principal cast reprising their roles. These too would be released as stand alone pictures some time after their initial serial run. Flash Gordon's Trip to Mars debuted in 1938, with Flash Gordon Conquers the Universe arriving in 1940. Like Rocket Ship, the movie versions would carry different names to their serial counterparts, becoming Flash Gordon: The Deadly Ray and The Purple Death from Outer Space. The characters weren't only confined to the silver screen either. In 1954, Telefusion and Intercontinental Television Films teamed up to produce a 39 part TV show. Curiously, while it would feature Flash, Dale and Zarkov, arch-nemesis Ming and the planet Mongo were nowhere to be seen. Despite remaining a popular strip, Flash Gordon would be absent from screens for a number of years, until George Lucas and Gary Kurtz attempted to secure the movie rights from King Features in the 1970s. King demanded too much money and creative control, leaving the duo to start from scratch. Lucas went on to borrow pieces from Flash Gordon (along with elements of Kurosawa's The Hidden Fortress) when he moved forward with his own original science fiction film, Star Wars. The subsequent huge success of Lucas' picture did not go unnoticed by uber producer Dino De Laurentiis. Laurentiis had been a producer working in Italy for a number of years - starting in 1940 with L'ultimo Combattimento. He went on to work on a variety of projects, including the production of Federico Fellini's La Strada, which won the first ever Foreign Film Academy Award in 1956. In the 1970s he turned his attention to America, working on such pictures as Serpico and Three Days of the Condor. After producing a remake of King Kong (to weak critical response but decent box office) it is said he witnessed the incredible success of Star Wars, and sought to secure the rights to Flash Gordon. It must be noted there is conflicting information regarding Lucas, Laurentiis and Flash Gordon. Some sources claim Lucas approached Laurentiis to buy the rights, and when turned down, went on to create Star Wars. Others state that Laurentiis only obtained the rights when he saw how successful Lucas' picture had become. According to the Internet Movie Database, producer Lou Scheimer sought out Laurentiis when he needed to raise additional funds to complete his animated Flash Gordon movie-of-the-week for NBC. Laurentiis agreed to help on the proviso that Scheimer could secure him the theatrical movie rights - which he promptly did. With the rights in hand, the project could move forward, and the Italian producer had one person in mind to direct. In 1930s Italy, most American comics were banned by Mussolini. However, prior to embarking upon his career in film, famed director Federico Fellini worked on a number of bootleg Flash Gordon strips. Upon securing the rights to the character and his universe, Laurentiis sought out Fellini to direct the big screen adaptation, but the director was not interested and turned down the offer. With Fellini out of the running, the producer looked to Nicholas Roeg to take on the job. Roeg had begun his career as a photographer and camera operator, graduating to a second unit photography credit on Lawrence of Arabia. In the 1970s he'd had a stunning run of films, making his directorial debut on Performance. He followed this up with the acclaimed Walkabout and horror film Don't Look Now. He gained further notice for the David Bowie science fiction drama, The Man Who Fell to Earth. Roeg sank himself into the entire Flash Gordon universe, and spent a year crafting a script. While impressed, Laurentiis passed, and informed Roeg: "I don't want to make that picture. Please stay and I'll tell you the picture I want to make." Roeg walked and the producer signed Mike Hodges on to helm the picture instead. Initially he was said to have been the choice to direct the already-in-the-works sequel. However, with Roeg out of the running, the Get Carter director was placed front and centre. There's conjecture over this situation, as some sources claim Hodges was actually the eighth director the picture was offered to. Third choice or eighth, Flash Gordon now had a director. The production also scored an ace when they managed to secure the talents of Star Wars director of photography, Gil Taylor. With Roeg's script deemed unusable, Laurentiis hired Lorenzo Semple Jnr. with whom he had worked on the King Kong remake. Semple got his start on the Adam West Batman TV show, scripting the pilot and the first four episodes, while also acting as executive story producer on the remainder of the first season. He'd go on to provide the screenplay for Batman the Movie in 1966. He changed tack for 1968's Pretty Poison, and won acclaim for his work on The Parallax View and Three Days of the Condor, which marked his first collaboration with Dino De Laurentiis. Knowing Semple's work on Batman, it's easy to see how Flash Gordon ended up with a similar tone despite the source material being a more serious affair. Casting could now get underway. The first choice to play Flash was Kurt Russell, who at that point in his career was something of a screen veteran. Russell had started acting in 1957, and became a popular child actor who had comfortably managed the transition to adult star. When the offer came through, he was busy working with John Carpenter on the TV movie Elvis. Russell quickly passed, deeming the character and script one-dimensional. A young Arnold Schwarzenegger, who had gained notoriety for his work on the documentary Pumping Iron, auditioned for the part, but was dismissed due to his strong Austrian accent. In the end, Flash Gordon was found in the most unusual of places - as a contestant on The Dating Game. Sam J. Jones had little acting experience, having had a bit part in the Dudley Moore comedy Ten, and a spread in Playgirl, but he looked the part of the all-American hero. According to Jones, one of Laurentiis' relatives had seen his appearance on The Dating Game and suggested him for the part; he was signed up the next day. Melody Anderson, who played Dale Arden (and also had a role in Carpenter's Elvis movie) found herself pursued by the producer, despite having the same opinion on the script as Kurt Russell. She'd already passed on the role but Laurentiis refused to take no for an answer. Anderson relented and found herself on board a plane for England that night. According to an interview she gave to Starlog in 1980, she arrived Saturday morning for a screen test and make up trial (including dying her blonde locks brown) and by Monday was on the way to Scotland to commence filming on Tuesday. Actor and singer Topol (famed for his role in Fiddler on the Roof) was chosen as Dr Hans Zarkov, and along with Max Von Sydow, added an international flavour to the cast - along with giving the production a certain amount of credibility. Sydow had been a fan of the comic strip as a boy and thought the role offered him something a little from the norm. In contrast Royal Shakespeare Company stalwart Timothy Dalton viewed the role of Prince Barin as little more than a paycheck. Elsewhere, somewhat disgraced actor Peter Wyngarde would provide a memorable turn as Ming's second in command, Klytus, while Brian Blessed offered a bombastic performance as Vultan - a role for which the actor is still best known despite a huge body of other work. Rounding out the cast would be Italian actress Ornella Muti, who would make her English language debut on the picture in a role that was almost as memorable as Blessed's. Flash Gordon may have looked a little cheap on screen, but this couldn't be further from the truth. The studio put forth a budget of between $20-30M (sources vary on this, though $27M is the figure regularly bandied about). The lavish sets and outrageous costumes would certainly attest to that. Indeed, some said the film itself was shot more around the costumes than it was the script. Filming took place in Scotland and England, at both Elstree and Shepperton studios. Things went off the rails almost as soon as shooting had commenced. With Semple's script more than a little on the camp side, Jones and Anderson were told to play the roles absolutely straight - which resulted in the picture becoming unintentionally funny. Upon seeing the first rushes, Laurentiis was upset by the laughter of the crew, and pushed the actors to play the roles with even more seriousness. This only made the performances funnier still. Scenes and sequence were created and scrapped with alarming regularity. The Italian crew didn't get on with the English one, and rarely discussed what the other should be doing - but both agreed they were right. Language barriers also meant the Italian crew weren't able to report back that things weren't quite how Laurentiis and the studio had envisioned. Director and cast would turn up on set with little idea of what they would find - either in terms of set design or costumes. Hodges shot whatever he could. Years later he would describe the film as "the only improvised $27-million movie ever made." The fabled duel between Barin and Flash left the actors covered in silver paint, which had to be removed between set ups. Impractical costumes made the shoot arduous for many, especially Vultan's hawk men who were unable to sit down once their wings were attached. The climactic attack on the War Rocket Ajax took three days to set up, and left many of the cast suspended in mid air for hours at a time. Blessed's hijinx resulted in the entire sequence being reset (something that took a further day to achieve) when it was revealed during the rushes that he'd accompanied his bazooka shots with 'pew, pew, pew'. Even Melody Anderson was caught up in the chaos. A proposed sequence would see Ming cause Flash to hallucinate that Dale had turned into a giant spider. A huge costume was created and the actress spent four hours in make up and a further six shooting the sequence only to be told that while it looked great, they couldn't use it as it had nothing to do with the script. Off set, Sam Jones was running into problems himself. Forever getting into fights, at one point he ended up in hospital requiring stitches to his face. According to legend, Laurentiis himself burst into the theatre and insisted the doctor leave the actor with no visible scarring. Such incidents led to one of the most infamous stories surrounding the shoot and one that would have a long-term effect on Jones' career. There are a number of theories behind the fact that Jones' voice was dubbed in the finished film. Hodges claimed the majority of filming was complete with only some second unit work remaining, for which he used Jones' stunt double. The director managed to find someone to impersonate Jones' voice for any lines required, which ended up being used in the finished product. However Jones claims the vast majority of his lines were dubbed. According to the book Dino: The Life and Film of Dino De Laurentiis, Jones and the producer had a falling out about money (and Jones' off-set behaviour) and when shooting broke for Christmas, the actor went back to Los Angeles, never to return. The book goes on to claim Flash Gordon must have been the only film completed without its principal star. Chances are there's truth to both these theories - with Jones' stand-in having to complete the film in his absence, and the impersonator doing the rest. In spite of all these issues, shooting was completed at a lightning pace due to the requirement of an extended post production period to add in the film's many visual effects. As the pieces started to pull together, thoughts turned towards the soundtrack. Mike Hodges wanted Pink Floyd, but ended up settling for Queen. The band's management approached the production upon seeing 20 minutes of the finished picture. Laurentiis had never heard of the legendary band but commissioned them to create the soundtrack upon hearing some of their work. Queen were given reign to produce whatever they wanted, provided it complimented the picture. Flash Gordon became the band's ninth album and the first of only two soundtracks they would provide (the other being Highlander). All but two tracks were instrumentals, though snippets of dialogue are heard throughout. The idea to use dialogue wasn't actually part of the original plan. Brian May and Roger Taylor were composing the score and inserted dialogue to get a feel for how the music would work within the film. Impressed with the experiment, they left it in the final product, leading to the memorable single, Flash. Dino De Laurentiis anticipated (and hoped) that Flash Gordon would be an even bigger hit than Star Wars. Hype was building as its December release approached, helped in part by trailers and Queen's Flash receiving plenty of airplay. Reviews were generally positive (the film holds an 81% approval rating on Rotten Tomatoes) with attention paid to the sets, costumes and soundtrack. 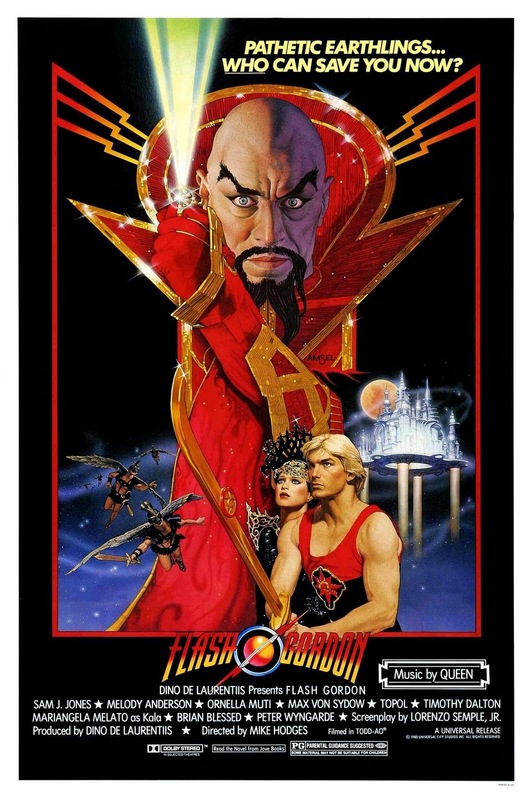 While not the costliest film of the time (as mentioned, the budget was somewhere between $20-30M), Flash Gordon still needed to be a sizable hit to recoup its budget and secure any sequels. In comparison, the number one movie of 1980, The Empire Strikes Back, cost $18M and made back $209M (admittedly this was the sequel to one of the biggest films of all time). Flash would have little in the way of competition, with only Popeye waiting in the wings. There were some comedy heavy-hitters in December, but as they didn't skew the same demographic, they weren't seen as competition as such. The picture opened on the 5th December 1980 at 823 locations, earning an OK $3.4M during it first weekend. While there's little to compare it to, Stir Crazy, which opened a week later, made $8.6M and the aforementioned Popeye earnt $6.3M. Thanks in part to the Christmas break, the picture would go on to earn $27.1M in North America and although it pretty much covered its costs, it was still seen as a flop. It performed very well in the UK, making $14M and becoming one of the biggest releases of the year. It did solid business in Italy too. But the film lacked the break out success of Star Wars, and that put any proposed sequel (or trilogy) to bed. Like Krull, Flash Gordon became a hit on the burgeoning home video market and gained a very strong cult following in the intervening years. Post-Flash, Sam Jones found himself in a number of TV movies and one-off episodes. He had a short-lived TV show in 1987, The Highwayman, which ran for 10 episodes before being cancelled. Since then he has continued to work but has never come close to the high profile of that first major role. Melody Anderson led a similar path, appearing in one-off episodes of popular shows of the time such as The A-Team and Murder She Wrote. She had recurring roles in St.Elsewhere and Manimal, but appeared to have retired from show business in 1995. Topol appeared in the mini-series War and Remembrance in 1983, and played the same part in the follow up The Winds of War. He would go on to reprise his Fiddler on the Roof role to great acclaim, touring the production through out the world. Max Von Sydow went from the strength to strength. Already a well respected actor, he would continue to mix mainstream Hollywood fare with smaller European movies. His role in 1987's Pelle The Conqueror helped earn the film a Best Foreign Film Academy Award. As is well documented, Timothy Dalton would take over from Roger Moore as James Bond, making his debut as the character in The Living Daylights. He gained further notice for his role in the Gone with the Wind sequel, Scarlett. At the time of writing he has a recurring role in the TV show, Penny Dreadful. Director Mike Hodges switched to TV movies before returning to theatrical releases with 1985’s Morons from Outer Space. The 1998 movie Croupier won him (and star Clive Owen) much attention. Flash Gordon's influence still resonates, with director Edgar Wright citing it as a favourite of his, and using some of its visual cues in Scott Pilgrim Vs The World. Writer and director Seth MacFarlane went a step further and featured the film prominently in his 2012 comedy, Ted. He even had Sam Jones play himself, recreating the rocket cycle scene with star Mark Wahlberg. Attempts to bring Flash Gordon back to screens have been made over the years, most notably in a 2007 TV series which ran for a single season. As recently as April 2014, there has been talk of another film, with Fox securing the rights to the character and setting Star Trek 3 (reboot) writers J.D. Payne and Patrick McKay to work on the script. Looking back today, the film still holds up well. The costumes and sets still impress, as does Queen's soundtrack. While some of the acting will elicit laughter, a number of sequences still work effectively, particularly the trial of the wood beast. And despite its campy tone, the picture is quite graphic in places and doesn't shy away from what are exceptionally traumatic experiences for the main characters - Flash's 'death' and Zarkov's memory wiping being the stand outs. With 2014 being the character's 80th birthday, there's no better time to rediscover the movie. Flash - He'll save every one of us. What a great write up, thx for taking me back. Brian Blessed stole every scene he was in and his belly laugh was huge.